Visual perception is the ability to interpret the surrounding environment by processing information that is contained in visible light. The resulting perception is also known as eyesight, sight, or vision (adjectival form: visual, optical, or ocular). The various physiological components involved in vision are referred to collectively as the visual system, and are the focus of much research in Linguistics, psychology, cognitive science, neuroscience, and molecular biology, collectively referred to as vision science. 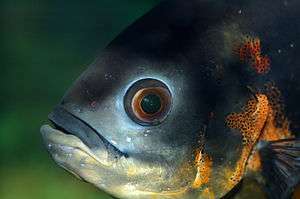 The visual system in animals allows individuals to assimilate information from their surroundings. The act of seeing starts when the cornea and then the lens of the eye focuses an image of its surroundings onto a light-sensitive membrane in the back of the eye, called the retina. The retina is actually part of the brain that is isolated to serve as a transducer for the conversion of patterns of light into neuronal signals. The lens of the eye focuses light on the photoreceptive cells of the retina, also known as the rods and cones, which detect the photons of light and respond by producing neural impulses. 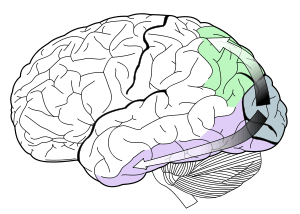 These signals are processed in a hierarchical fashion by different parts of the brain, from the retina upstream to central ganglia in the brain. Note that up until now much of the above paragraph could apply to octopi, mollusks, worms, insects and things more primitive; anything with a more concentrated nervous system and better eyes than say a jellyfish. However, the following applies to mammals generally and birds (in modified form): The retina in these more complex animals sends fibers (the optic nerve) to the lateral geniculate nucleus, to the primary and secondary visual cortex of the brain. Signals from the retina can also travel directly from the retina to the superior colliculus. Alhazen (965–c. 1040) carried out many investigations and experiments on visual perception, extended the work of Ptolemy on binocular vision, and commented on the anatomical works of Galen. Hermann von Helmholtz is often credited with the first study of visual perception in modern times. Helmholtz examined the human eye and concluded that it was, optically, rather poor. The poor-quality information gathered via the eye seemed to him to make vision impossible. He therefore concluded that vision could only be the result of some form of unconscious inferences: a matter of making assumptions and conclusions from incomplete data, based on previous experiences. Another type of the unconscious inference hypothesis (based on probabilities) has recently been revived in so-called Bayesian studies of visual perception. Proponents of this approach consider that the visual system performs some form of Bayesian inference to derive a perception from sensory data. Models based on this idea have been used to describe various visual perceptual functions, such as the perception of motion, the perception of depth, and figure-ground perception. The "wholly empirical theory of perception" is a related and newer approach that rationalizes visual perception without explicitly invoking Bayesian formalisms. During the 1960s, technical development permitted the continuous registration of eye movement during reading in picture viewing and later in visual problem solving and when headset-cameras became available, also during driving. The picture to the left shows what may happen during the first two seconds of visual inspection. While the background is out of focus, representing the peripheral vision, the first eye movement goes to the boots of the man (just because they are very near the starting fixation and have a reasonable contrast). It can also be noted that there are three different types of eye movements: vergence movements, saccadic movements and pursuit movements. Vergence movements involve the cooperation of both eyes to allow for an image to fall on the same area of both retinas. This results in a single focused image. Saccadic movements is the type of eye movement that makes jumps from one position to another position and is used to rapidly scan a particular scene/image. Lastly, pursuit movement is smooth eye movement and is used to follow objects in motion. There is considerable evidence that face and object recognition are accomplished by distinct systems. For example, prosopagnosic patients show deficits in face, but not object processing, while object agnosic patients (most notably, patient C.K.) show deficits in object processing with spared face processing. Behaviorally, it has been shown that faces, but not objects, are subject to inversion effects, leading to the claim that faces are "special". Further, face and object processing recruit distinct neural systems. Notably, some have argued that the apparent specialization of the human brain for face processing does not reflect true domain specificity, but rather a more general process of expert-level discrimination within a given class of stimulus, though this latter claim is the subject of substantial debate. Transduction is the process through which energy from environmental stimuli is converted to neural activity for the brain to understand and process. The back of the eye contains three different cell layers: photoreceptor layer, bipolar cell layer and ganglion cell layer. The photoreceptor layer is at the very back and contains rod photoreceptors and cone photoreceptors. Cones are responsible for color perception. There are three different cones: red, green and blue. Rods, are responsible for the perception of objects in low light. Photoreceptors contain within them a special chemical called a photopigment, which are embedded in the membrane of the lamellae; a single human rod contains approximately 10 million of them. The photopigment molecules consist of two parts: an opsin (a protein) and retinal (a lipid). There are 3 specific photopigments (each with their own color) that respond to specific wavelengths of light. When the appropriate wavelength of light hits the photoreceptor, its photopigment splits into two, which sends a message to the bipolar cell layer, which in turn sends a message to the ganglion cells, which then send the information through the optic nerve to the brain. If the appropriate photopigment is not in the proper photoreceptor (for example, a green photopigment inside a red cone), a condition called color vision deficiency will occur. Transduction involves chemical messages sent from the photoreceptors to the bipolar cells to the ganglion cells. Several photoreceptors may send their information to one ganglion cell. There are two types of ganglion cells: red/green and yellow/blue. These neuron cells consistently fire—even when not stimulated. The brain interprets different colors (and with a lot of information, an image) when the rate of firing of these neurons alters. Red light stimulates the red cone, which in turn stimulates the red/green ganglion cell. Likewise, green light stimulates the green cone, which stimulates the red/green ganglion cell and blue light stimulates the blue cone which stimulates the yellow/blue ganglion cell. The rate of firing of the ganglion cells is increased when it is signaled by one cone and decreased (inhibited) when it is signaled by the other cone. The first color in the name if the ganglion cell is the color that excites it and the second is the color that inhibits it. i.e. : A red cone would excite the red/green ganglion cell and the green cone would inhibit the red/green ganglion cell. This is an opponent process. If the rate of firing of a red/green ganglion cell is increased, the brain would know that the light was red, if the rate was decreased, the brain would know that the color of the light was green. ↑ Carlson, Neil R. (2013). "6". Physiology of Behaviour (11th ed.). Upper Saddle River, New Jersey, USA: Pearson Education Inc. pp. 187–189. ISBN 978-0-205-23939-9. ↑ Swenson, Rivka. (Spring/Summer 2010). Optics, Gender, and the Eighteenth-Century Gaze: Looking at Eliza Haywood’s Anti-Pamela. The Eighteenth Century: Theory and Interpretation, 51.1-2, 27-43. ↑ Finger, Stanley (1994). Origins of neuroscience: a history of explorations into brain function. Oxford [Oxfordshire]: Oxford University Press. ISBN 0-19-506503-4. OCLC 27151391. ↑ Howard, I (1996). 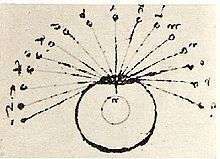 "Alhazen's neglected discoveries of visual phenomena". Perception. 25 (10): 1203–1217. doi:10.1068/p251203. PMID 9027923. ↑ Khaleefa, Omar (1999). "Who Is the Founder of Psychophysics and Experimental Psychology?". American Journal of Islamic Social Sciences. 16 (2): 1–26. ↑ Stone, JV (2011). "Footprints sticking out of the sand. Part 2: children's Bayesian priors for shape and lighting direction". Perception. 40 (2): 175–90. doi:10.1068/p6776. PMID 21650091. ↑ Mamassian, Pascal; Landy, Michael; Maloney, Laurence T. (2002). "Bayesian Modelling of Visual Perception". In Rao, Rajesh P. N.; Olshausen, Bruno A.; Lewicki, Michael S. Probabilistic Models of the Brain: Perception and Neural Function. Neural Information Processing. MIT Press. pp. 13–36. ISBN 978-0-262-26432-7. ↑ Taylor, Stanford E. (November 1965). "Eye Movements in Reading: Facts and Fallacies". American Educational Research Journal. 2 (4): 187–202. doi:10.2307/1161646. JSTOR 1161646. ↑ Hunziker, H. W. (1970). "Visuelle Informationsaufnahme und Intelligenz: Eine Untersuchung über die Augenfixationen beim Problemlösen" [Visual information acquisition and intelligence: A study of the eye fixations in problem solving]. Schweizerische Zeitschrift für Psychologie und ihre Anwendungen (in German). 29 (1/2). ↑ Cohen, A. S. (1983). "Informationsaufnahme beim Befahren von Kurven, Psychologie für die Praxis 2/83" [Information recording when driving on curves, psychology in practice 2/83]. Bulletin der Schweizerischen Stiftung für Angewandte Psychologie. ↑ Carlson, Neil R.; Heth, C. Donald; Miller, Harold; Donahoe, John W.; Buskist, William; Martin, G. Neil; Schmaltz, Rodney M. (2009). Psychology the Science of Behaviour. Toronto Ontario: Pearson Canada. pp. 140–1. ISBN 978-0-205-70286-2. 1 2 Moscovitch, Morris; Winocur, Gordon; Behrmann, Marlene (1997). "What Is Special about Face Recognition? Nineteen Experiments on a Person with Visual Object Agnosia and Dyslexia but Normal Face Recognition". Journal of Cognitive Neuroscience. 9 (5): 555–604. doi:10.1162/jocn.1997.9.5.555. PMID 23965118. ↑ Yin, Robert K. (1969). "Looking at upside-down faces". Journal of Experimental Psychology. 81 (1): 141–5. doi:10.1037/h0027474. ↑ Kanwisher, Nancy; McDermott, Josh; Chun, Marvin M. (June 1997). "The fusiform face area: a module in human extrastriate cortex specialized for face perception". The Journal of Neuroscience. 17 (11): 4302–11. PMID 9151747. ↑ Gauthier, Isabel; Skudlarski, Pawel; Gore, John C.; Anderson, Adam W. (February 2000). "Expertise for cars and birds recruits brain areas involved in face recognition". Nature Neuroscience. 3 (2): 191–7. doi:10.1038/72140. PMID 10649576. ↑ Bruce, V.; Green, P.; Georgeson, M. (1996). Visual perception: Physiology, psychology and ecology (3rd ed.). LEA. p. 110. ↑ Marr, D (1982). Vision: A Computational Investigation into the Human Representation and Processing of Visual Information. MIT Press. ↑ Hecht, Selig (1937-04-01). "Rods, Cones, and the Chemical Basis of Vision". Physiological Reviews. 17 (2): 239–290. ISSN 0031-9333. ↑ Carlson, Neil R. (2013). "6". Physiology of Behaviour (11th ed.). Upper Saddle River, New Jersey, USA: Pearson Education Inc. p. 170. ISBN 978-0-205-23939-9. 1 2 Carlson, Neil R.; Heth, C. Donald (2010). "5". Psychology the science of behaviour (2nd ed.). Upper Saddle River, New Jersey, USA: Pearson Education Inc. pp. 138–145. ISBN 978-0-205-64524-4. ↑ Barghout, Lauren, and Lawrence W. Lee. "Perceptual information processing system." U.S. Patent Application 10/618,543, filed July 11, 2003. ↑ Barghout, Lauren. "System and Method for edge detection in image processing and recognition" WIPO Patent No. 2007044828. 20 Apr. 2007.